B) I don’t want ANYBODY’S religious freedoms trampled on but if one makes a claim that a pill causes an abortion as part of their legal filings they should be required to prove that before it is accepted as an argument before the court. If you say “x harms me and as such I shouldn’t be required to do x” shouldn’t you have to prove the harm done by x? Or are we now allowing people to claim harm when none exists? C) It doesn’t matter how many kinds of pills Hobby Lobby provides. Other companies take an even more restrictive stance and would ban all oral contraception. This ruling allows that. D) the decision of what pill a patient should use should be up to her and her doctor only. Hobby Lobby (and other employers) should have no say. E) The birth control, and any other benefit obtained in lieu of pay, should all be considered paid, IN FULL, by that employees labor and that employees labor alone. F) This is not about religious freedom. Had an Islamic group complained under the RFRA Conservatives would not have come out in support of them. This is about forcing Christian beliefs on others using government. G) Previously the way that we dealt with a bad ruling (Lily Ledbetter v Goodyear Tire) we elected a Democratic Congress to support this President and enable him to deliver on a change to the law via the Lily Ledbetter Fair Pay Act. It is time to rally the troops and do this again. If we edit the Religious Freedom Restoration Act and require persons claiming harm to establish that harm is actually happening before requiring government to prove why the actions causing the harm are necessary then we can return the law back to where it should be. Liberal Dan Radio 6/11/2014: DOWN GOES CANTOR! Back from vacation and so much to discuss. Louisiana Governor Bobby Jindal signed a bill into law that seeks to retroactively strip the ability of local flood protection agencies to sue oil companies for damage done to the flood protection system by their drilling processes. So much for the free market. This smells more like protectionism. I will go into why this is a bad idea and why this decision is similar to what happened in Oklahoma . Louisiana also embarassed itself by requiring doctors to keep a dying pregnant woman alive, despite any advance directives, in order to allow her to be a breeding vessel. I will briefly cover this and the other law that required doctors to have admitting privileges in nearby hospitals. But the main point of discussion this week will be the stunning loss of Eric Cantor, House Majority Leader, in a primary election. All through my attempts to push the #RetakeCongress I have said that no election should be taken for granted. I have discussed the desire of the media to mock underfunded candidates in order to prove that money is needed to win elections (specifically money to buy their advertising). I have discussed why it is vital to get out and vote in every election. Cantor losing puts a huge exclamation point and should clearly show why it is vital to not sit at home on election day. 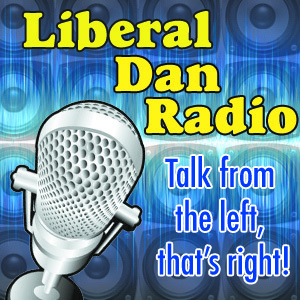 Those issues, headlines, tweet of the week and more at 8pm Central on Liberal Dan Radio: Talk From The Left, That’s Right. Have you ever wished you had a way to make sure that the items you purchase are not funding causes you disagree with? The old fashioned way of protesting when companies supported causes you did not agree with was to join a large group and to make a large show of it and hope others will join in. Well, I am going to talk to Austen Hoogan, creator of the idea called CottBot, and discuss his upcoming crowd-funding campagn to support this free mobile application. Instead of boycotting one business for violating one of your ideals, you can boycott all businesses who violate all your ideals. Then I will be discussing #retakeCongress, the hashtag I will be using to discuss the upcoming 2014 elections and what needs to be done to take Congress back. First up is Ron Dickey, candidate for Congress in the MS01 Congressional district. I will discuss with Ron how his campaign is going, what his priorities would be when he goes to Congress, and how he intends on making that a reality. And then I will discuss the candidacy of Edwin Edwards for Congress in Louisiana’s 6th congressional district. Yup, he went ahead and did it. And I will talk about it some more becuase it is important. Those issues, tweet of the week, headlines, words of redneck wisdom and more this Wednesday at 8PM Central on Liberal Dan Radio, Talk From The Left, That’s Right.